These mini figure sets came out earlier this year, but with Halloween approaching I thought now was the perfect time to feature them. 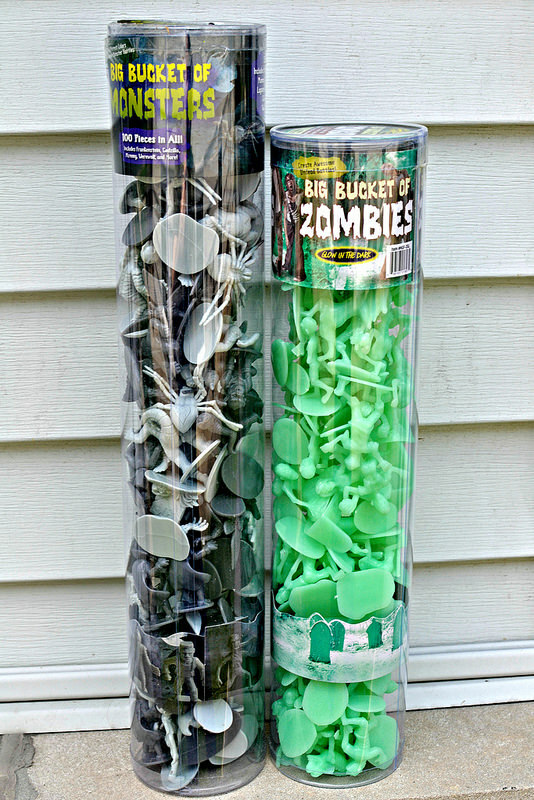 There are two different sets here--one is called "Big Bucket of Monsters" and the other is "Big Bucket of Zombies." Both sets come in long, clear plastic tubes containing 100 figures each. They are sold by SCS Direct through Amazon here (Monsters) and here (Zombies). All of the figures are made of hard plastic, and most of them measure around 2 inches tall. 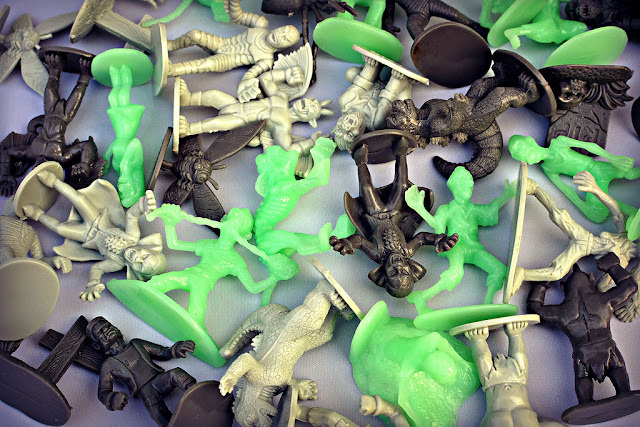 I was most excited about the monster set, because we've seen plenty of monochromatic "army men"-style zombie figures in recent years, but not so many monsters. Plus, the creators chose some unusual creatures to include. Not only do we have old stand-bys like Dracula, Frankenstein, the Wolfman, and the Mummy, we've also got pretty random additions like Godzilla, Mothra, a cyclops, and a giant spider. 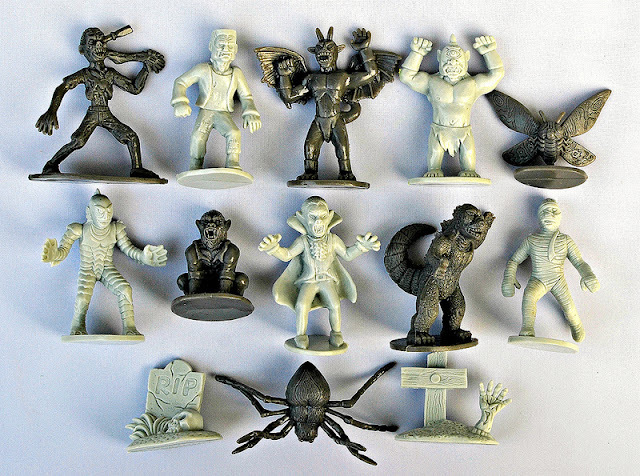 In addition to those, the monster set includes a zombie, a demon, the Creature from the Black Lagoon, a RIP gravestone, and another grave with a wooden cross and monster hand sticking out of the ground. That makes 13 different sculpts. 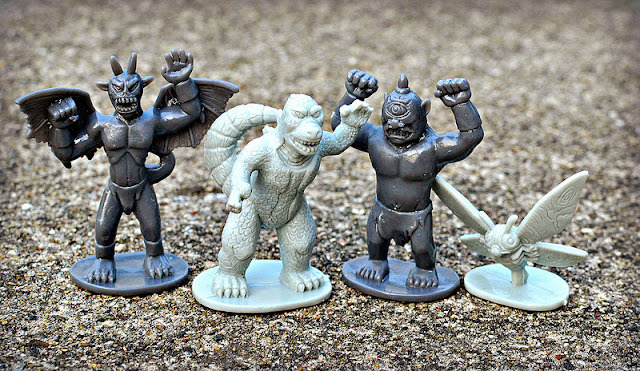 Each monster comes in two different colors--dark gray and light gray. I wish they would have chosen more exciting colors, but maybe they were going for a vintage black-and-white monster movie feel. There's so many different color possibilities if these get reissued. How about an orange and black set for next Halloween? The sculpts are really nice, for the most part. Mothra seems too small--more like a baby Mothra. The Mummy is in some sort of odd running pose. Other than that, we've got some real winners here. My favorites are Godzilla (great texture), the suitably evil-looking winged demon, and the cyclops, which--along with the demon--would also make a great addition to a fantasy setup. 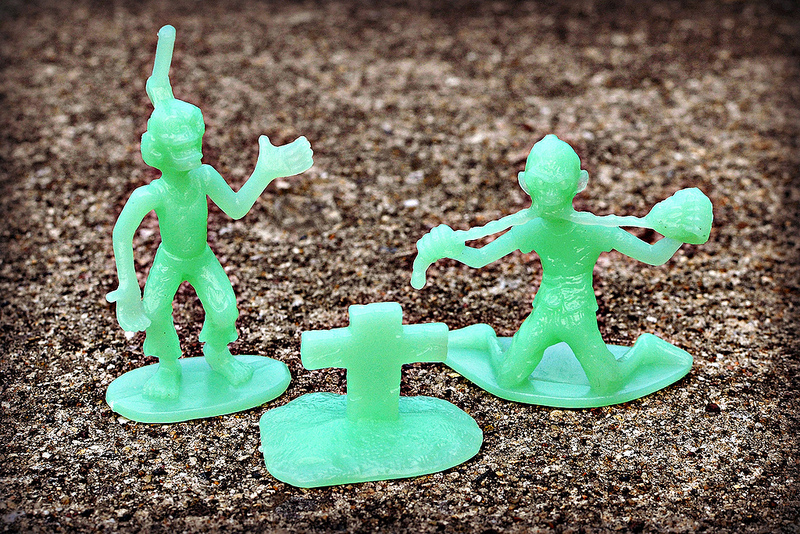 The zombies are not quite as unusual or exciting, but they are among the best sets of toy solider-type zombie minis that I've seen. The set stands out from others because it includes some unique and inspired sculpts, like a zombie dog and zombie cat, and a zombie crawling out of the ground. 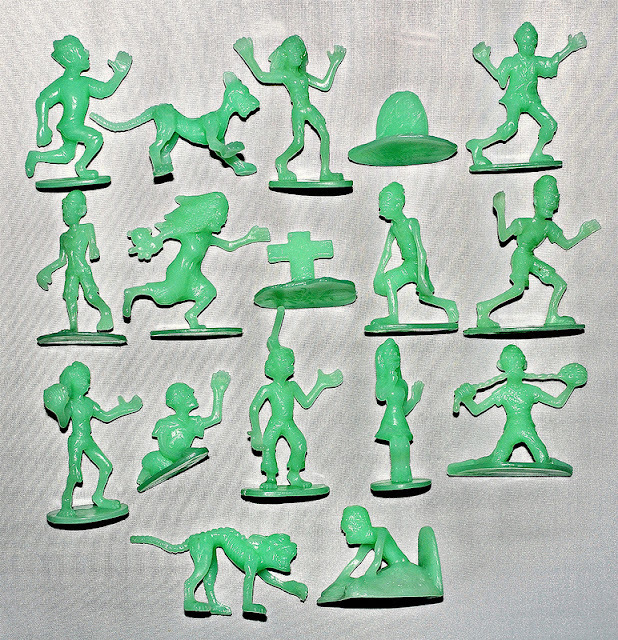 There are a total of 17 different sculpts in the Big Bucket of Zombies, including a mix of zombies, scared victims, and as with the monster set, a couple of tombstones. There are two different versions of this set available--one with green glow-in-the-dark figures and one with the same light and dark gray colors as the monster set. I chose glow-in-the-dark. They look great, but the downside is that details of the sculpts are harder to make out. My personal favorites are the gnarly dog and cat! And here's a close-up of a few more figures from the set. Gotta love the dude with an axe stuck in his noggin. All in all, really cool sets. 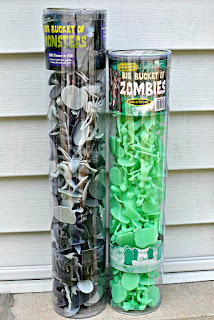 I'd say the monsters are a must-buy, and the zombies are also well worth owning if you're a zombie nut. According to the Fantasy Toy Soliders blog, there's rumblings of a fantasy-themed set in the works from this company. Bring it on! Have any of you guys picked up these sets yet? What's your take? I have some of the Monster ones but i have to double check and see if i have the Cyclops or The Demon ones...i got mine on a trade so i might be missing those but i can't remember now lol. Those are two of the best...the cyclops is probably my favorite figure from the set. Ok i just double checked and i do have the demon and cyclops! I balked at the price until I remembered it's 100 freakin monsters! I may have to get some to put in Trick or Treat bags. Yeah, not bad considering how many figures you get. Would have been better if there were more than 2 colors in the tube, but still worth it. 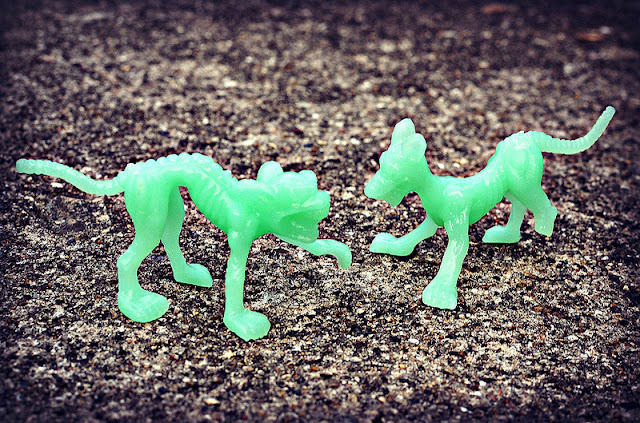 Great set, thanks for the spotlight on those great little monsters! I always look forward to your new installments. Nice finds! Glad you enjoy--thanks for your comment! Love the Monsters set -- Sadly they don't ship to AU, but I would be all over these if they did! These are awesome! I love that Demon and Ray Harryhausen style Cyclops (from The 7th Voyage of Sinbad, 1958)! The Zombie Dog & Cat steal the zombie show! Yeah, I was also thinking that the sculptor must have been inspired by Harryhausen's Cyclops! That demon is Pazuzu of Exorcist fame. Glow in the dark ones are at Dollar Tree, in small carded bags and not glow in the dark. Are they the exact same sculpts? I have only seen pics online but I thought they were different. Looks like it. They're $1, worth trying no?